The modern 17-digit Vehicle Identification Number (VIN) became mandatory for new vehicles sold in the United States beginning with the 1981 model year. The VIN is broken down into six components, and each part holds a key to decoding the identity of an individual vehicle. The first part consists of the beginning three characters, which tell us what company manufactured the vehicle and in what country. Known as the World Manufacturer Identifier (WMI), these three-digit prefixes are assigned to each automaker by the National Highway Transportation Safety Administration (NHTSA) for vehicles sold in the United States. The second portion of the VIN is contained in the 4th through 8th characters, but this is a little less straightforward. In this section, called the Vehicle Descriptor Section, manufacturers are given the opportunity to encode various information about the individual vehicle, but each manufacturer does things a little differently. Manufacturers are required to include the following information within these five characters: For passenger cars, the vehicle line, series, body type, engine and restraints are mandatory. For multipurpose passenger vehicles like minivans and SUVs, they must also include the gross vehicle weight rating (GVWR) class. Light truck manufacturers must identify the line, series, cab type, GVWR and braking system. (By default, light trucks have hydraulic brake systems, so this information is often combined with the GVWR class.) Some companies also include emissions information and transmission type within this section, but these are optional. The 9th digit is called the check digit, and it is used mostly by motor vehicle departments and law enforcement for checking the validity of a VIN. This number is calculated using a complex formula that assigns a numeric value to the other 16 digits of the VIN based on their position in the sequence. The sum of these values is divided by 11, and the remainder becomes the 9th digit. This will always be a number (0-9), or the letter “X”. This is the least useful part of the VIN for anyone who works behind a parts counter, but it still is important in the grand scheme of the universe. Rounding out our top 10, we come to the model year. From 1981 to 2000, the letters B through Y were used (except for I, O and Q, which never appear anywhere in a VIN, and U, which never appears in the 10th position) to identify the vehicle’s model year. 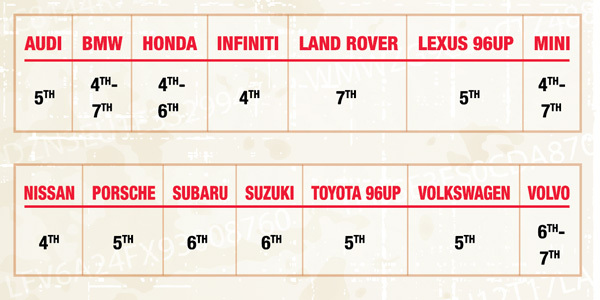 2001 through 2009 model years use numbers 1-9. 2010 saw the return of the alpha characters, starting with A, and continuing in the same pattern used in the 80s and 90s. 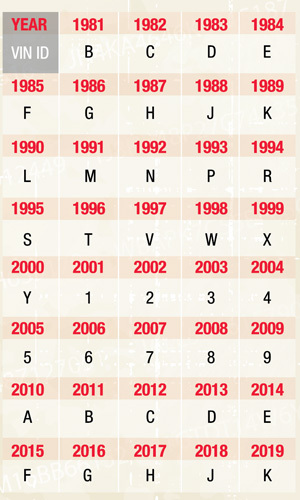 Of course, once manufacturers started repeating model year codes, it became difficult to tell, based on the number alone, if a VIN was from 1981 or 2011. NHTSA thought of that already, and the key lies in the 7th digit of the VIN. Even though the 7th digit of the VIN can represent a number of things, for vehicles built through 2009, it must be a number. For model years 2010-2039, the 7th character will always be a letter. Since the VIN is intended to be a uniquely identifiable number, NHTSA also has mandated that the VIN for any two vehicles “manufactured within a 60-year period beginning with the 1980 model year shall not be identical.” At this point, your guess is as good as mine what will happen in 2040. Maybe by then we will have bar-coded VIN plates, like those awesome license plates in “Back to the Future” … no, wait … that would have already happened in 2015. The 11th position of the VIN takes the place of manufacture to another level, signifying the individual assembly plant. Sometimes, unique components are manufactured or installed in different plants, and we need to use the 11th digit to identify which option is installed. Something as simple as a wheel stud and lug nut for a Ford Taurus might require a parts specialist to determine if the car was assembled in Atlanta or Chicago. For those of us working in stores that mix paint, it also is worthwhile to note that Honda uses assembly plant codes as part of their paint codes. Variant formulas exist for colors, depending on where they were assembled and painted, and this bit of information may make the difference between a “close match” and an “exact match,” as well as the difference between a satisfied customer and an unhappy one. The last portion of the VIN is the sequential serial number that uniquely identifies a particular vehicle. Historically, the last six characters of the VIN have been a sequential number series, but only the last five characters are actually required to be numeric. It is becoming more common for the 12th character to be a letter, expanding a manufacturer’s ability to assign unique VINs as their production capacity increases. If you’ve ever called the dealer to source a part, chances are they only want to know the “last 8” of the VIN, so they can catalog the parts based on that vehicle’s unique build information. Based on our breakdown, we know that gives us the model year, assembly plant and the serial number. In any given model year, only one Brand Z vehicle with serial number 123456 will roll out of Assembly Plant X, so those 8 digits only can be assigned to one vehicle every 30 years. Dealerships don’t expect many folks to request parts for a 30-year-old vehicle, so model-year code overlap isn’t much of a problem for them. In the aftermarket, we would require an entire VIN sequence to catalog parts in this manner, since our catalogs cover multiple manufacturers and a wider range of parts availability. While a parts specialist may not use their knowledge of VIN decoding every day – and rarely would you be asked to fully decode a VIN to identify what a customer is working on – becoming familiar with the parts of the VIN can certainly make life easier behind the counter. From determining which engine option is installed, to verifying the year or location of manufacture, there is a great deal of information that can be discovered without ever opening the hood or door. When attempting to identify the exact model or submodel of your customer’s car, it also can save you from making that trip to the other end of the parking lot in the rain, only to find out that the “LX” or “DX” badge you were hoping to find isn’t there anymore!